My latest book focusing on drug and gun crimes in New Jersey is coming along and I hope to have it out before the end of the year! Our firm is proud of its publications and this blog which is based on actual client questions. Illegal firearm and gun offenses are a large part of our New Jersey criminal defense practice which serves South Jersey, specifically Camden, Cumberland, Burlington, Gloucester, and Mercer Counties. Like Pennsylvania, New Jersey has a number of statutes which govern the illegal use and possession of firearms and guns which is known collectively as the Graves Act in the Garden State (The Uniform Firearms Act in Pennsylvania). WHAT IS A “WEAPON” IN NEW JERSEY? Firearms, even if they’re not loaded or lacking a clip or other component to render them immediately operable. Components which can be readily assembled into a weapon. Gravity knives, switch blade knives, daggers, stilettos, blackjacks, metal knuckles. Stun guns or any weapon which projects, releases, or admits tear gas or other substances intended to produce temporary or permanent injury. It’s important to keep in mind that this definition is not specifically limited to guns and firearms but includes virtually anything including a handgun. New Jersey maintains a prohibited person statute under 2C: 39-7, like Pennsylvania (18 § 6105). In New Jersey a person who has been convicted in the state or any other jurisdiction, including Pennsylvania, of Aggravated Assault, a violent felony such as Homicide, Endangering the Welfare of a Child, and certain drug offenses such as the leader of a narcotics network (2C: 35-3), Maintaining or Operating a Production Facility (2C: 35-4), and Manufacturing, Distributing, or Dispensing a Controlled Substance (2C: 35-5), is prohibited from possessing a firearm and commits a crime of the second degree if he or she does so. Remember that in New Jersey a crime of the second degree carries with it a presumption of incarceration in state prison, whereas crimes of the 3rd and 4th degree do not carry this presumption. While the term weapon is broadly defined in the Garden State, it’s important to keep in mind that even if a person is convicted of one of these “enumerated” offenses they are still prohibited from carrying these other weapons in New Jersey. If it’s not a firearm however, a person is guilty of a 4th degree crime, which is much less serious. In addition to the enumerated offenses, a person who is convicted in New Jersey or any other state, like Pennsylvania, of any crime involving domestic violence, whether or not that crime involved a weapon, is not permitted to own or possess a firearm and commits a crime of the 3rd degree if he or she does so. Finally, any person who has been committed for any mental disorder to any hospital, mental institution, or other treatment center, is prohibited from carrying a weapon in New Jersey and commits a 4th degree crime if he or she does so. 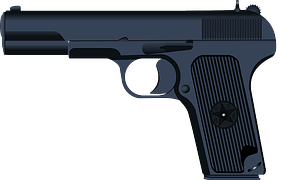 For more information on weapons offenses in New Jersey and specifically those involving illegal guns and firearms please keep reading my blog and visit the free download section.